Firms offering review services can be found easily on Taobao. Since its inception in 1994, Amazon has revolutionised ecommerce, offering consumers amazing deals on practically everything with an unparalleled service. From selling books out of Seattle, Amazon has relentlessly expanded, entering new markets at a rapid rate, its rise seemingly unstoppable. For many, Amazon has become the one-stop-shop for online purchases, constituting the first port-of-call for those researching what product to buy. But, buyer beware, not everything is as it seems. 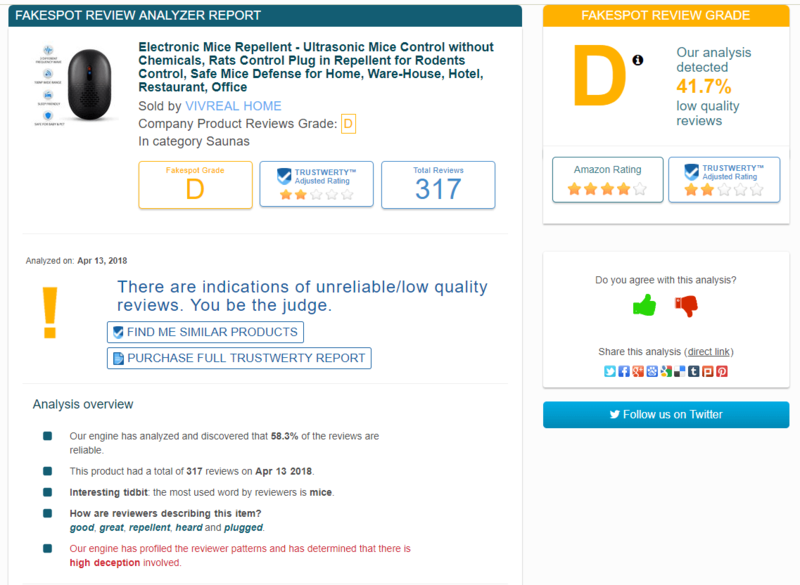 Vendors have manipulated product listings with fake-reviews, leading unsuspecting consumers buying second rate products at the expense of reputable brands. And it has got worse with both ReviewMeta and Fakespot (third-parties dedicated to exposing fake reviews) software picking up more and more fake reviews. How do vendors manipulate reviews? Initially, Amazon allowed “review clubs” whereby professional reviewers would receive a free or heavily discounted item in return for a review. Reviewers simply had to list they had received the item from the vendor in return for a review. But, what did this incentivise? Fake reviews. Vendors had no reason to offer products to reviewers who would leave a bad rating, so they simply selected those who would leave positive reviews. Likewise reviewers realised vendors would only select reviewers who left positive reviews, so they left positive reviews in order to receive more and more free products. Those who left critical reviews weren’t chosen for the review clubs or were quickly shut out. This was exposed in a video by ReviewMeta in 2016, which quickly rose to the front page of Reddit. Amazon subsequently banned the practice, pushing it underground. Now consumers have no way of determining an incentivised review. Review clubs still exist, but a more insidious form of manipulating reviews has emerged. 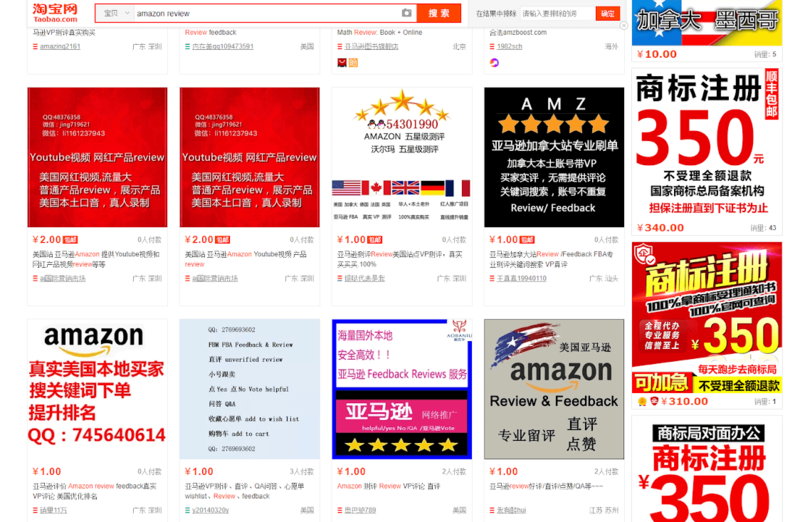 Suppliers, primarily from China, use fake-review firms to manipulate review scores, who have developed sophisticated methods to evade Amazon’s algorithms. These firms can’t simply create dozens of accounts and leave dozens of reviews. These would be quickly removed. Rather they have to trick Amazon into believing a product was bought and sent. To do this, the review firm uses UK proxies to purchase goods to locations in the UK. The product is not sent, but the vendor marks it as shipped with a fake tracking number and the review firm refunded via paypal. The review firm then leaves a review, which is marked with Amazon’s “verified purchase” label. The only cost involved is Amazon’s fee, which is charged to the supplier. We believe Amazon, seeing a high volume of reviews, will then request a DHL waybill as proof of shipping, which the supplier fakes. Now, the supplier’s product has dozens, if now hundreds of positive reviews, they can enhance their listing through Amazon’s Fulfilled By Amazon (FBA) service. FBA allows firms to send their products to Amazon’s warehouse, who will then ship the product for them. This is especially important for Chinese suppliers, who can now avoid costly shipping from China, or establishing a warehouse in the UK. Further, it provides the Amazon Prime label, which may trick some into believing it was an Amazon approved product. By using FBA and fake reviews, products become eligible for the Amazon Choice label that does indicate the product is approved by Amazon. Products are assigned the label if they are highly-rated, well-priced products with Prime shopping! Fake review firms benefit the supplier’s product in another way – by pushing it up the listing for certain keywords. Like Google, Amazon will promote products they believe are relevant to a keyword and that users are likely to buy. (This earns them more money – earnt through the seller’s fee.) They base this off a user’s search history. Hence to manipulate a listing, the fake review firm searches for a keyword a supplier wishes their product to rank and then purchases it. This convinces Amazon’s algorithm that the product is relevant to that keyword. Usually, it takes months before a product appears high in a listing, but through this method a product can quickly appear on the first page. The supplier can boost their listing in other ways – through Amazon Marketing Services (AMS). AMS allows vendors to bid on keywords, allowing them to occupy the sponsored slots at the top of a listing. Hence, a fake reviewed product can be listed twice, in the natural and sponsored listings. Lastly, suppliers can boost their listing through placing their products in obscure categories, where it is easy for it to become a bestseller. This provides the bestseller tag, even for unrelated keywords. This Vivreal rat repeller is the Bestseller in indoor insect control for flies. You can see this information by going to the additional information section of a product page. The screengrab below is a search for “rat repeller”. It should be noted, Amazon still does promote reviews through its Amazon Vine programme, which has a number of safeguards to ensure reviews are balanced and informative with no contact between supplier and reviewer. Primrose suffers as it has to compete with dozens of artificially boosted fake reviewed products. These products can have hundreds of fake 5 star reviews, giving the impression of an excellent product. The listings are often updated with jargon (2018 Model, New Model) designed to give the impression of product innovation, when in fact they use the same technology as older models but with cosmetic changes. Hence, the consumer also suffers when they receive a fraudulent model. We regularly report fake reviewed products to Amazon with limited success. Amazon will investigate a listing, but will not report their findings for privacy reasons. Disappointingly, Amazon will not take a listing down even after it has removed reviews. As such, it is our opinion that many of the listings you’ll see on the first page for certain product categories will be fraudulent. How do I spot a fake reviews? A telltale sign of fake reviews is loads of reviews in a short period. Estimate the demand for a product. Do you think that many people have purchased it in a period? You can look at the date first available under additional information or the date a review was left. Consider that at a max 5% of purchases will leave a review. Hence times the reviews by 20 to arrive at the number of units sold. Alternatively, times the number of reviews in a week by 20 to arrive at the number of units sold in a week. For example, Primrose rat repeller was first listed in Nov 2008 and has garnered 1,725 reviews. That’s around 170 a year. The Vivreal Home rat repeller was listed in May 2017 and has garnered 317 reviews. That’s over 300 a year. Another Vivreal Home product, this time the multipack of the rat repeller was listed in Oct 2017 and has garnered 186 reviews. That’s again over 300 a year. Another telltale sign is a rating well above what you would expect for a specific product category. The adage bears true, if you think it too good to be true, it probably is. As we admit to on our website, we believe ultrasonic repellers to be the best solution to a rat infestation, but that does not mean it will work in every case. Hence, one can expect a fair share of disappointed consumers for this product category. Another tool is to compare UK suppliers with Chinese suppliers and new entries with established brands. If you can’t believe a cheap Chinese import is better than an established brand’s product, it probably isn’t. 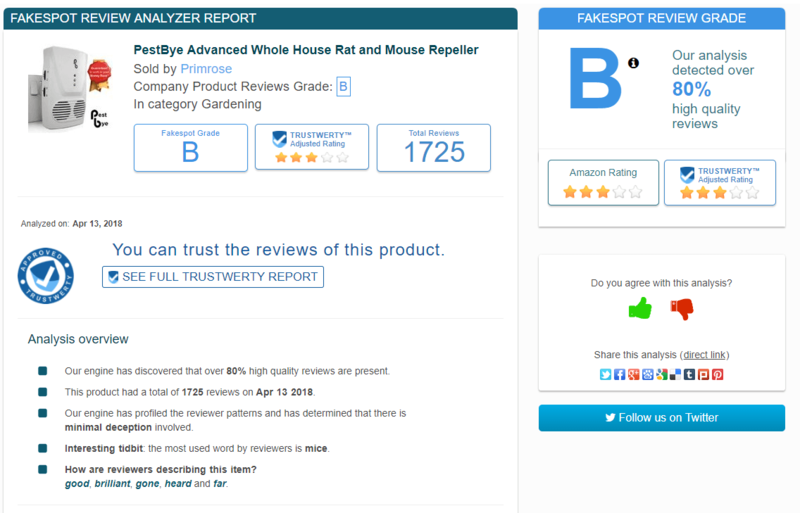 You can also use ReviewMeta and Fakespot’s software to analyse a page for fake reviews. Below you can see the results for Vivreal Home and Primrose’s own rat repeller. What has Amazon done to correct the problem? Jorge works in the Primrose marketing team. He is an avid reader, although struggles to stick to one topic! His ideal afternoon would involve a long walk, before settling down for scones. Jorge is a journeyman gardener with experience in growing crops. See all of Jorge’s posts. A well written article. The problem is that Amazon is just massive, I mean really massive and understand the author’s frustration in doing business on-line. I’ve used Primrose on a number of occasions and to be fair, their products are good, delivery is very quick and above all the business represents great value. But… Sadly, you ain’t going to beat them. But… I, like many on line buyers (because, sadly, I don’t have the time to wonder down the high street any more) are starting to be a little more savvy. i.e. I look to buy from British companies, I look for operational addresses on the website (because if you’ve nothing to hide etc) and UK phone numbers. Most importantly of all, is don’t compromise on quality. The best example is Marks & Spencer’s food hall. Most expensive food on the planet, have rarely been caught out on any food scandal because their loyal customer base trust them. And there’s the key word…Trust.